Titanium Cubette hookah coals are natural coconut coals made from 100% compressed coconut shells, containing no wood or other additives. Cubettes are sized in between flats and cubes measuring approximately 3/4" on each side. These are perfect for anyone looking to add more coal to their heat management devices. Titanium coals are more dense in nature than other natural hookah coals, and thus even appear to be a bit less "spongy" looking than your typical natural coals. These coals are designed to be so dense so the life of each individual is extended, eliminating the need to rotate your coals so frequently. 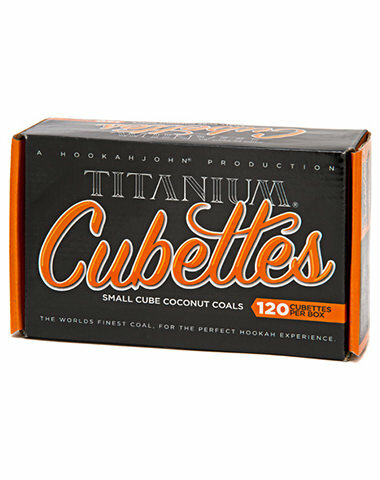 The Titanium Cubette hookah coals are currently available in 120 piece boxes. Cubette Titanium Coals has a average rating of 0 stars out of 5 stars based on 0 reviews.